Selamat Datang di Open Journal System Institut Agama Islam Negeri (IAIN) Kendari. 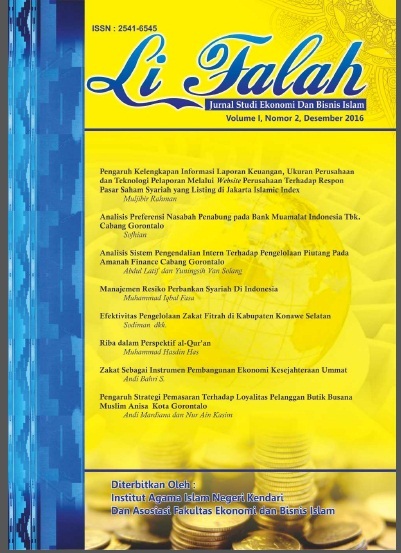 Li Falah : Journal of Islamic Economics and Business Studies; ISSN:2541-6545 (print) and ISSN: 2549-6085 (online) is a scientific journal concerning on the latest research results and becomes a scientific communication media for lecturers, researchers, and or observers in the Islamic economics and business field. 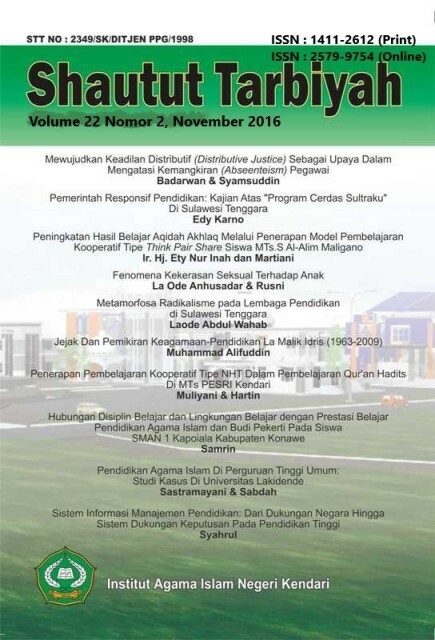 Published by Islamic State Institute of Kendari, Southeast Sulawesi, in association with Islamic Economics and Business Faculty Association. Li Falah's journal is published twice a year, every June and December. Li Falah accepts articles on research, book review, and critical review on Islamic Economics and Business. Already have a Username/Password for Li Falah? Zawiyah: Journal of Islamic Thought published by the Postgraduate of IAIN Kendari includes textual studies and field work with various perspectives on education, law, philosophy, history, theology, political science, and more. This journal serves as a scientific forum for lecturers, researchers and other communities, this journal invites scholars and researchers outside the Institute to contribute the result of their studies and researches in the areas related to Islam and muslim society. Indonesian scholars can enrich studies through articles published in journals. Articles written in Indonesian have abstracts in English and with fair procedures for peer-review, Zawiyah publish research and studies relating to Islamic studies with various dimensions and approaches. Zawiyah: Journal of Islamic Thought is published twice a year, each issue focuses on the investigation of academics through comprehensive observations of Islamic Studies. This journal, serves as a forum for studying Islam in Indonesia and other parts of the world in local and global contexts. Therefore, researchers, writers, and readers from various scientific backgrounds have interacted scientifically. Langkawi: Journal of The Association for Arabic and English is a peer-reviewed journal, published twice a year by UPT Pengembangan Bahasa IAIN Kendari. Langkawi Journal invites scholars, researchers, and students to contribute the result of their studies and researches in Arabic and English with linguistic studies, both in micro and macro terms, such as applied linguistics, philology, script studies, including Arabic and English language education. Jurnal Al-'Adl merupakan Jurnal Ilmiah yang diterbitkan oleh Fakultas Syariah IAIN Kendari. Al-'Adl secara spesifik mempublikasikan tulisan ilmiah baik naskah ilmiah maupun hasil penelitian yang berorientasi pada masalah hukum Islam dan pranata sosial serta kajian keislaman lainnya. 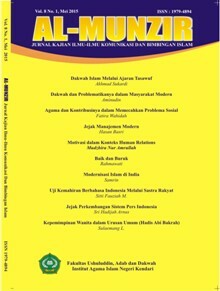 Jurnal Al-Izzah (p-ISSN: 1978-9726; e-ISSN: 2541-0717; http://ejournal.iainkendari.ac.id/index.php/al-izzah/index) is a peer-reviewed journal that publishes scientific articles covering library as well as fieldwork research which concerns Muslim society as the central focus of academic inquiry. Al-Izzah published twice a year, in May and November, under publication management of Institute of Research and Community Development (LP2M) IAIN Kendari. Al-Izzah welcomes submission of previously unpublished article (both library and fieldwork studies) from national and international academics, researchers, and students concerning social religious issues in Muslim society, especially in social and religious perspectives. All articles will be subject to a preliminary internal interview. Those considered appropriate will be sent to two reviewers for double-blind review. Decision for publication, amendment, or rejection is based upon their reports/recommendation. In certain cases, the editor may submit an article for review to another, third reviewer before making a decision, if necessary. Al-Ta'dib journal is a forum for publishing original articles related to research-based education or Islamic education. This journal is for professionals and scholars whose empirical work focuses on curriculum, teaching methodology, learning activity, teaching media, learning approaches, learning achievement, character education, evaluation in education and the relationship between Islam and education.